Our designers possess extensive professional experience and are known for the “magic touch” when walking you through your project fluently, deeply understanding your style and needs, and provide you with unique and elegant solutions. Our Company is providing to the clients via Architectural Survey an assortment of options in documenting existing building or site conditions for a purposes of future remodeling. It involves obtaining interior/exterior dimensions and input them into digital drawings in architectural program. That step is important for old buildings when original drawings don’t exist or are not accurate. Landmark city committees required to perform architectural surveys on historical buildings as well. In collaboration with landscape architects, we develop innovative design plans for different environments like hotels, colleges, parks, public places, and recreational facilities, commercial and residential properties. Our plans seamlessly combine functionality and beauty by incorporating creative video simulation. NYRender is offering to our clients that require DOB sets of drawings in-depth consultation about relevant construction and design aspects of their future projects. This includes analysis of building feasibility, current Building Code and ADA requirements, possible Department of Buildings and Landmarks constraints that are currently in effect, alternative development options and estimated range of related costs. 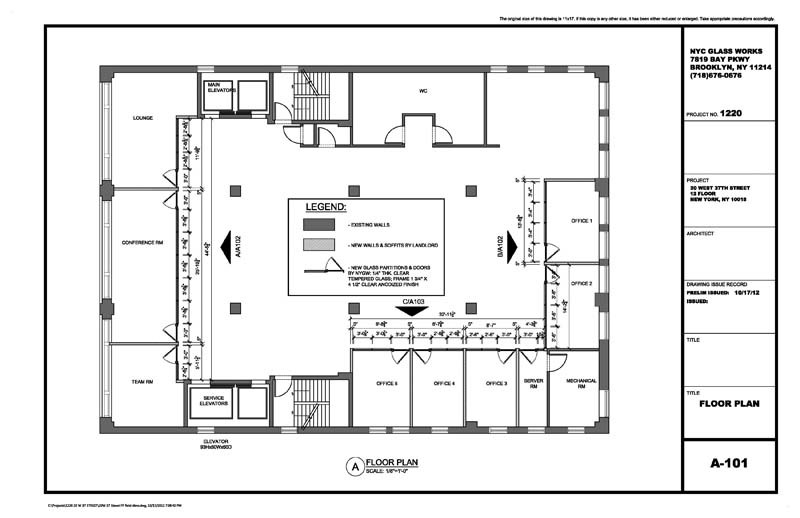 Our DOB sets of drawings include, but are not limited to, plot plan, riser diagram, energy calculations, proposed floor plan, finish plan, elevations, reflected ceiling plan, power plan, HVAC plan, sections, schedules and specifications, and other specific details required to file an application and obtain a building permit. We provide expert Design Development services that involve converting a project’s schematic design into exclusive sets of drawings and documents, including designing details, selecting materials, fixtures, and furnishings. We create As-built Survey and Drawings as required by DOB after construction of the building is complete. The intention of these plans is to document any deviations from the architect’s original design. The completed renderings also guide our creation of thorough and clear construction and bid documents. The Construction Drawings are submitted to the local building authority for issuance of the Building Permit. The “Permit Set” must include floor plans, elevations, details, and specifications adequate for their review of all code compliance issues. Your Construction Documents will include extensive drawings including dimensioned and keynoted plot plan, Architectural Floor Plans, Exterior Elevations showing the Facades, Lighting, and Signage, Interior Elevations showing Built-In Cabinetry, materials, and finishes, required Sections and Architectural Details and a detailed Reflected Ceiling Plan with the lighting layout, security, and sprinklers, the riser diagram, energy calculations, and power plan, HVAC plan, schedules and and other specific details required to file an application and obtain a building permit. While the permit set is in the building department’s review process, we continue to refine, review, and complete the architectural drawings. Our extensive technical experience in site design, industrial design, millwork, furniture and product design, as well as architecture, brings a level of sophisticated detail to your project learned only through years of successful practice.